f.22 'Interior of Mullick Umber's Tomb. 23 Sep'. Rauza. bl.uk > Online Gallery Home	> Online exhibitions	> Asia, Pacific and Africa Collections	> f.22 'Interior of Mullick Umber's Tomb. 23 Sep'. Rauza. 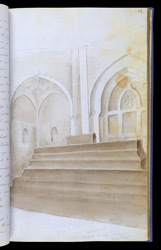 Wash drawing of the interior of Malik Ambar's tomb at Rauza by an anonymous artist in 1849. This is one of 83 drawings (78 folios) mainly of landscapes and antiquities in the northem Deccan, made during a tour chiefly to Ellora, Rauza, Daulatabad, Aurangabad and Ajanta between September and November 1849. A few sketches were made later, e.g. 1853. Rauza or Khuldabad, meaning ‘Heavenly Abode’ is an old walled town in Maharashtra famous for its onion-domed tombs. The town is of religious significance to Muslims as the Emperor Aurangzeb (reigned 1658-1707) is interred here, together with other members of his dynasty and several Muslim saints. Malik Ambar was an ex-Abyssinian slave and prime minister of the independent Muslim kingdom of the Nizam Shahis based at Ahmadnagar. His tomb or dargah (1626) is enriched with cusped arches in plasterwork and raised on a low platform; it is situated next to the tomb of his wife, Bibi Karima.